You don't have to be a metalhead to fall in love with this adorably dark family of loons. Sweetly subversive a la The Adams Family, this book make me cackle aloud approximately 666 times. In a few short years, what started out as improvised social-media doodles has now become a wildly successful webcomic with hundreds of thousands of fans. 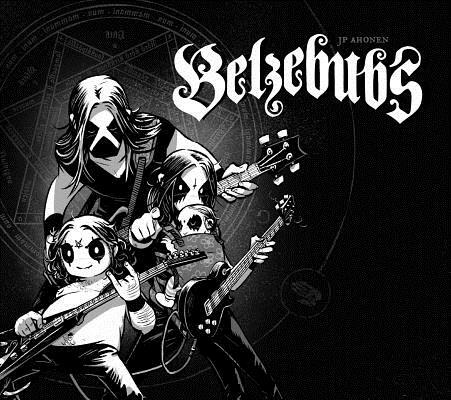 The irresistible cartooning of JP Ahonen (Sing No Evil) combines relatable slice-of-life humor with over-the-top occult antics and references from metal music to Lovecraftian horror, making Belzebubs a devil of a good time. JP Ahonen is the author of two Sunday newspaper comic strips published weekly in his native Finland. He also appeared in Kazu Kibuishi's Flight anthologies #4-8. His debut graphic novel Sing No Evil, co-written with KP Alare, gathered wide critical acclaim and has been published in seven languages. After spending his teenage years immersed in making music and comics, Ahonen continued to the University of Lapland to study graphic design in the Faculty of Arts. Today, JP works as a full-time comic book artist and teaches classes in schools and universities. He lives in Tampere, Finland with his wife and kids. He is the guest of honor of the 2018 Helsinki Comics Festival, held September 1-2, 2018.